I arrived, holding-hands with Robbie (The French are romantic after all!). Bistro Pierre itself is a well-lit establishment and it offers an enticing kerb-side view, its top-to-toe glazed, the outdoor seating area and array of foliage make it stand out from the crowd - and you can see right inside... you can actually see the delight on the faces of other diners tucking into their meals. It's interior and exterior is aesthetically pleasing. Robbie and I found ourselves engaged with the décor, the lights and wall art and often declaring that such items would be well-placed in our new home (another story, another day). We were greeted by a well-groomed gentleman with a French-twang in his accent which added that certain va-va-voom to the initial welcoming. We liked that! We were given the option to select our own table and a quick glance we opted for a central seating place, purely because we wanted to hone-in on what others were having and saying about their foodstuff, and feel like we were in the centre of the action. We're not nosy people (honestly! ), but I'm sure we are all guilty of looking at what other people are eating around us - aren't we? I think we do this for approval/disapproval. We took a quick look around and noticed empty plates, everywhere... not only that, the food that was being sent out from the kitchen was passing us by and at that moment we started our new relationship of love with Bistrot Pierre. We knew instantly. We just knew. This was "our" new place. When you see plate-after-plate of food that make your eyes travel with it in awe, as the waiter(ress) breezes past you. We experienced this handfuls of times before it was our turn to be wowed by culinary delight and intrigue. Bistrot Pierre should not only be considered a treat but, it should be a regular choice in my opinion. The prices, the delicious food, excellent service and overall atmosphere are all things I want to be a part of as often as possible. Whether you find yourself transported to France for breakfast, lunch or dinner, it's an experience to devour. Additionally, Bistro Pierre have a six-course extravaganza that is usually a couple of times per month and seemingly this would be a wonderful experience... if you go first-time and love it as much as we did then you'd be certainly considering one of the special six-course evenings. 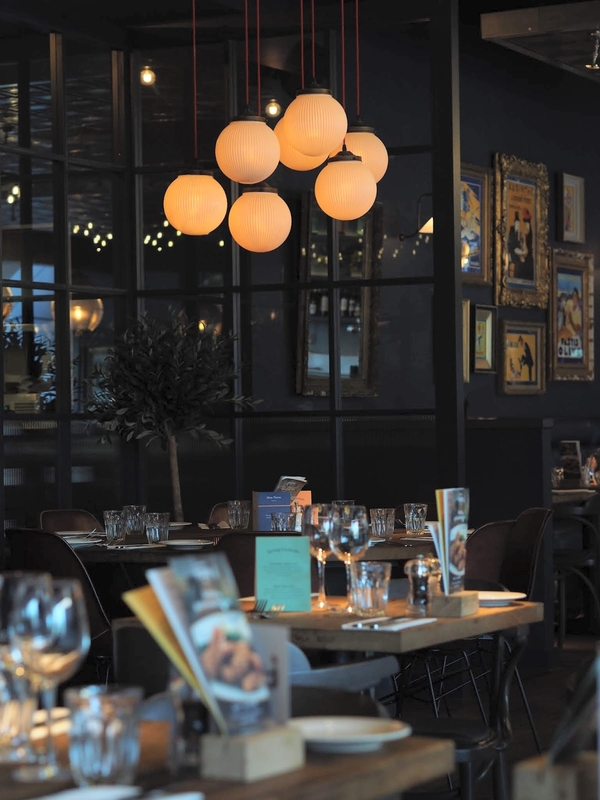 We were there to review the new Spring menu, a collection of French bistrot classic dishes and regional favourites, with enough choice for even those hard to please people we all know. While waiting for our drinks and starters to arrive, I found myself transfixed, watching the chefs cooking through the glass panelled wall towards the back of the restaurant, you can almost feel the passion coming from the kitchen as they prepare each and every plate to perfection. We were also given a basket of freshly baked bread, still warm from the oven to graze on while our starters were prepared. Our first courses were promptly delivered, I had opted for a dish from the specials board; Noix de St Jaques; pan fried scallops with Alsace bacon and hazelnut butter and Robbie had his favourite (we have become somewhat regular customers! ); Crottin de chevre a light and bright baked goats cheese dish, served with marinated beetroot, chicory, watercress, toasted walnuts & grain mustard dressing. Both of which not only looked incredible on the plates, you can see that time and effort are spent on presenting the food, with just as much importance as the cooking, but taste was also top restaurant quality, something which is generally lacking in Middlesbrough, and is oh so appreciated now that we have somewhere to be proud of. My scallops were seared the perfect amount, to achieve a decadent caramelized crust on the outside, a complete contrast in texture to the soft and slightly sweet inside that I love so much. With the addition of crispy and salty bacon plus the ever so moreish hazelnut butter, I couldn't have asked for a better starting dish. The flavour combinations kept me excited throughout... and this certainly whet my appetite for the rest of the meal and set the bar very high for what was to follow. Robbie's salad looked equally as tempting, the delicate, buttery cheese was paired perfectly with vibrant green leaves, juicy beetroot and a glossy mustard dressing. All in all, a wonderful start to our three courses. After literally polishing our plates clean from our starters, our main course choices soon arrived at the table, accompanied by a bowl full of brightly coloured, fresh seasonal vegetables and an iron skillet filled with beautifully cooked and seasoned new potatoes. Many of the main courses had me tempted when initially choosing what I should order, but deciding on the Poulet Printanier; pan fried chicken breast with asparagus, fricassee of wild mushrooms, peas, truffle oil and tarragon turned out to be the best decision I made all evening. Tender, melt in the mouth chicken breast, sliced and placed into the most fragrant and delicious creamy sauced packed full of flavours so unique and delicious that they somehow managed to envelop the taste of Spring. Robbie had opted for the Boeuf Bourguignon Maison; classic recipe of braised beef, shallots, red wine, mushrooms and bacon. A delicate cut of juicy beef, presented in a beautifully vibrant manor with a rich red wine sauce, so shiny you could almost check your reflection in it, salty pink bacon and a fresh green garnish. This appeared to be a really popular choice amongst the other diners that evening too, and it's easy to see why. When it came to the final course of the evening, my sweet tooth made this the toughest decision of them all, it's fair to say that the options for dessert are mouth watering to say the least, and thankfully, despite feeling very well fed from the first two courses, the portion sizes are controlled enough so that I could manage a dessert also. After much deliberation, I opted for the Café Gourmand; Four miniature desserts featuring a berry macaroon, chocolate brownie, caramel profiterole and vanilla ice cream on an almond crumble served with or without an espresso coffee. (I opted for with, and donated it to Robbie, who needed the strong, aromatic hit of caffeine after a long day at work!) Being able to taste four desserts in one felt like such a treat, and my taste buds couldn't get enough... The chocolate brownie, topped with crumbled pistachios was my favourite of the four; gooey, indulgent and rich. I also really enjoyed the creamy vanilla ice cream sitting on a bed of crumbled almond flavour biscuit. The macaroon was light with a sharp, tangy berry flavoured centre and the profiterole was sticky, sweet and oh so smooth. All in all, a simply beautiful dessert, not only in appearance, but in taste too. Robbie was feeling a little fuller than I, so ordered the Mousse Au Chocolat; Rich Valrhona chocolate and hazelnut praline mousse. Not only was the cocoa topped mousse light and fluffy, it was faultless in texture, so light and flavoursome, with an added richness from the cocoa, a really decadent end to the meal. Before we knew it, our third round of empty crockery was being cleared from our table, we were saying 'Merci beaucoup' and it was time to leave behind the magical Parisian atmosphere and return to the reality of Middlesbrough. It's such a comforting feeling to have found somewhere local, where we can go to relax, enjoy really delicious food and be transported to a place where you can feel like you're really in the midst of a romantic French city. You can find Bistrot Pierre on Albert Road in Middlesbrough, as well as in another 23 locations around the UK. Our meal was complimentary in return for this review, but all thoughts and opinions are my own. I highly recommend the two courses for £11.95 for lunch and £14.95 for dinner - It's the best deal in Middlesbrough!